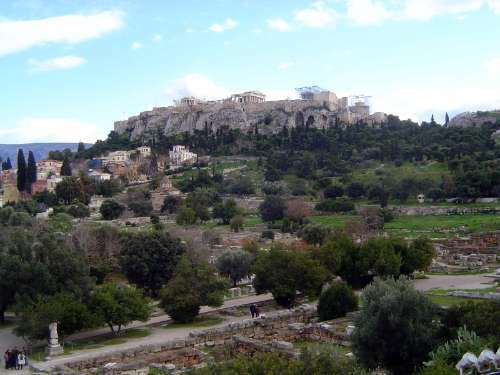 The agora, broadly the civic center of ancient Athens, lay at the toe of the north slope of the Acropolis. Not much is left, but the emptiness is mostly the result of archaeologists doing what they do, in this case removing recent settlement. 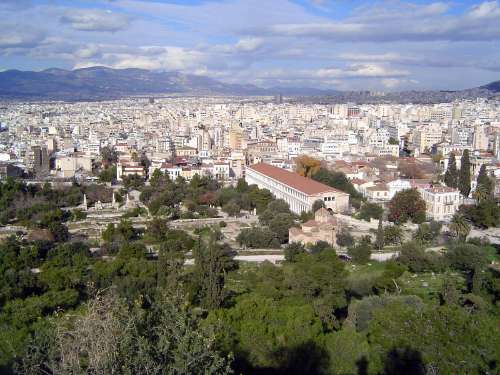 The view down to the Agora, with a recently reconstructed stoa or shopping center on the right. The view back uphill. 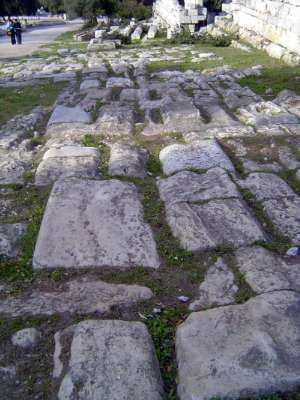 The area that would become the agora was a cemetery until the seventh century B.C.. Solon cleared six acres, and the area was expanded by Pisastratus. The buildings were damaged by the Persians in 480 and destroyed in A.D. 267 by the nomadic Herulians. The area lay abandoned between the 6th and 10th centuries, then was resettled. Clearing began in the late nineteenth century with Rockefeller support; excavation began in 1931 by the American School of Classical Studies. Revealed: the ancient Processional Way. 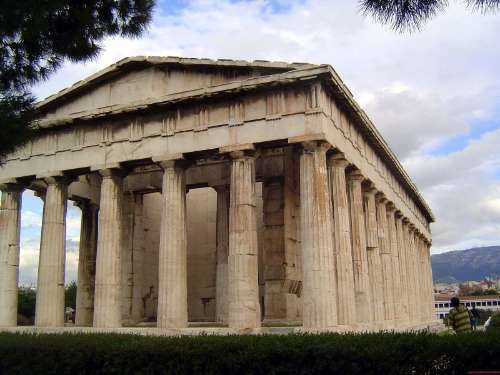 At the west end, the best preserved temple of classical antiquity: the Temple of Hephaestus. This is a 6 by 13-column temple, faithful to the 2n+1 formula. Like the Parthenon, the solid walls framed two unconnected rooms--a shrine and a treasury, but the roof here was of terra-cotta tiles, not marble. 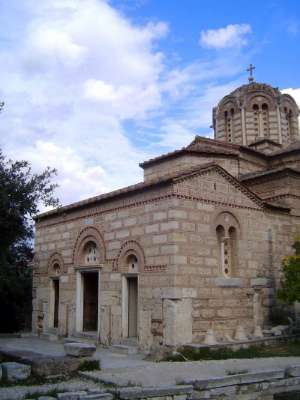 Theodosius I in 391 closed all pagan temples, and this one, too, became a Christian church--Agios Georgios. The change necessitated changing the public entrance from the west side to the east. The pediment sculptures were removed at that time. In 1834 the old building became a museum. The Christian additions were removed in 1937. A bit industrial in contrast, as though the parts came from Home Depot, this is a replica of one of the several original stoas, covered halls with a colonnade on one side and a wall on the other. 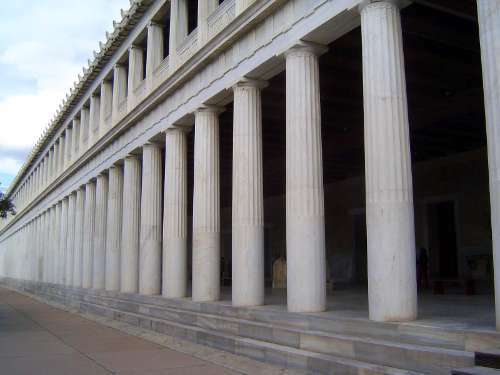 This one is the Stoa of Attalos, the Athens-educated king of Pergamon (r. 159-138). It's unusual in having two stories. 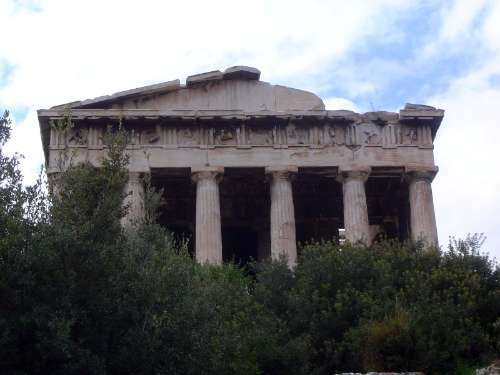 It was built from the ground up by the American School of Classical Studies. The original building was dismantled after the invasion of 267, and its back wall was incorporated into a defensive city wall. Many centuries later, the site was excavated between 1859 and 1902. Rebuilding began in the 1950s. 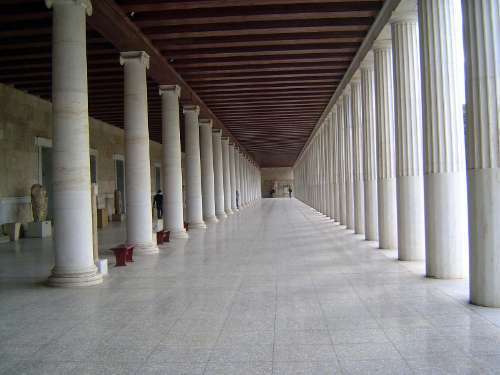 The great length of the stoa--380 feet--is subdivided by interior columns into 21 spaces. Behind them are 21 doors leading to 21 shops. There were 21 more upstairs. The unfluted column bases are authentic and intended to prevent damage from passersby. 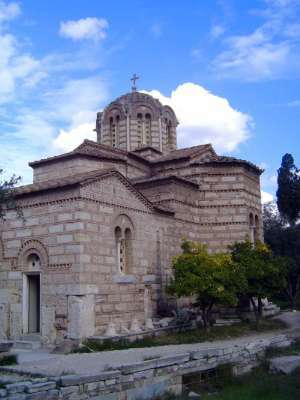 The Church of Agioi Apostoloi, or the Holy Apostles, was built in the agora about 1000 A.D. The vestibule, though also constructed of stone rimmed with brick, is a later addition. The floor plan is unusual, with a cross in a square. 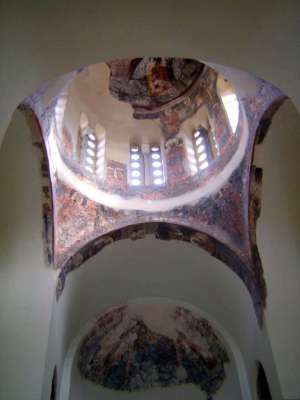 The central dome rests on ancient, reused columns and capitals. 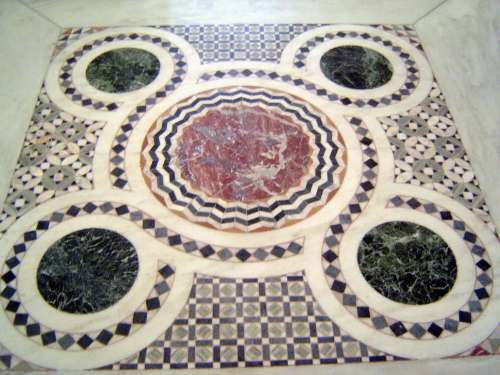 The floor plan has four arms of equal length, but the corners have been filled in with additional bays to create the square. 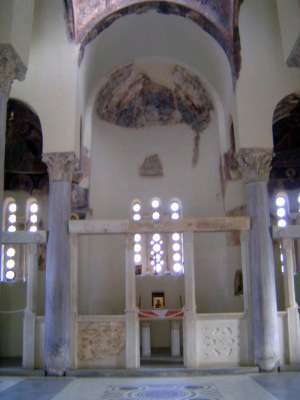 The iconostasis or screen before the sanctuary has been removed.